The concept of a bored dog is only the first thing to elicit giggles in this tale of wacky boredom. 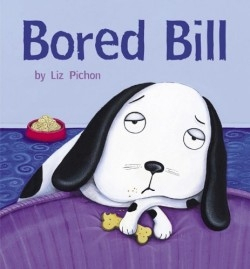 The star of the story is Bill, a floppy-eared dog who is really, really bored. Nothing—not reading, gardening, cooking, or Kung Fu—interests him. His owner, Mrs. Pickle, likes to keep busy all day, which seems to bore Bill even more. She tries making suggestions and finally tells him, “Only boring dogs get bored. Besides, it’s no fun sitting around all day doing nothing.” She puts on his leash and literally drags him outside for a walk even though it is a cold and very windy day. The two of them are lifted up by a gust of wind that catapults Bill into outer space, where he lands on a planet inhabited by aliens. He thinks that surely he won’t be bored there; after all, everything is new! But the inhabitants of this purple planet—three one-eyed green aliens and one little two-eyed one—are even more bored and boring than Bill. When he tries to get them to go exploring, they whine that it’s too boring. When they finally eat, it’s slimy green food that Bills finds disgusting. Bill is outmatched by these boring aliens and starts wishing he were back home with Mrs. Pickle. He realizes that she is right—doing nothing all day is really boring—so he decides to get busy. He cooks for the aliens, shows them Mrs. Pickle’s best Kung Fu moves, and gets them to play games. No one is bored anymore, but Bill still misses Mrs. Pickle and wants to go home. The aliens take him home, and Bill is a changed dog. He is never bored again! The author sends a powerful message in a way that is very engaging. Pichon is also the illustrator of this volume, and she uses a lot of soft purples, lime greens, and apple reds to make the pictures pop. Since Bill is white with black spots, he stands out on every page. This is a dog’s story and the images are drawn from his level: Mrs. Pickle’s head is never seen. She wears flowery dresses and high-heeled shoes, and she reads romance novels. She’s easy to like. The author is an accomplished children’s book writer and illustrator, with many titles to her credit, including The Very Ugly Bug. This book about a bored dog was originally published in Great Britain, but it will appeal to kids everywhere with its whimsical illustrations and a hero who makes boredom seem out-of-this world.